When planning out your home theater, seating should be a top consideration. Make sure to get the other details right first, so that you know exactly where the seating should go for best visual and audio appeal. Once those details have been squared away, consider more personal factors. Who will be viewing movies and shows in the room, how many people will usually be in the room, and general style and comfort preferences may all be important considerations when selecting seating. Home theater seating can give everyone the best spot in the room. Most home theater seating comes with three or four seats that are separated by arms with cup holders and sometimes even small tables or storage areas. Home theater seating can be very comfortable, but is generally best for a small audience that doesn’t mind sitting apart. While home theater seats can be placed in rows, the viewing angle may not be ideal from back rows. Room alterations to make different levels may help rectify this. If you like to snuggle up during movies or sit together as a family, a sectional may be preferable to home theater seating. Many sectionals come with some of the perks that home theater seating offers, such as cup holders next to one or two seats and recliners in some seats. Sectionals may also provide some versatility so that you can change the set-up whenever you desire. Bar seating is often put behind home theater seating. This gives those sitting at the bar a perfect vantage point, creating extra seating without cluttering the room. Bar seating is a great addition to a home theater that will be used for entertaining as well as viewing, as the audio can be used for music instead of movies and guests can congregate around the bar and talk. If your home theater is relatively small or if you need to fit a lot of people into the home theater on a regular basis, stadium seating may be the way to go. Stadium seats fold up when not in use and some recline back when in use, so these seats are highly functional. You can fit several rows without taking up too much space, though you should find a way to add levels for best viewing angle. 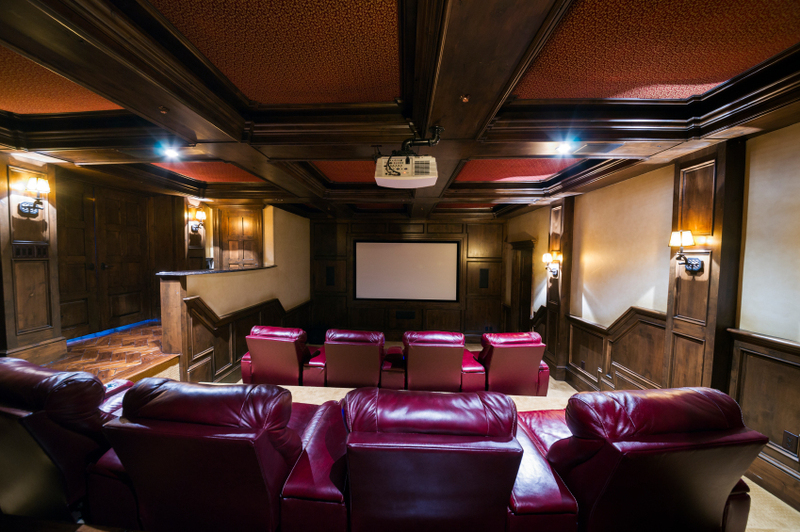 If you want some help deciding on the best seating for your new home theater, call us today at 407-314-3963.